Some of the members associated with Creative Connection’s are:- Rituparna Sengupta, Saptrishi Ghosh, Jaya Bhattacharya, Pyumori Ghosh, Sayantini Ghosh, Indraneil, Barkha Bisht and many more from the field of acting. Shaan, Udit Narayan, Raja Hassan, Debojit, Keka Ghoshal, Srijit, Reema, Vandana, Jaan Kumar, Avijit Roy and some more from the field of music. 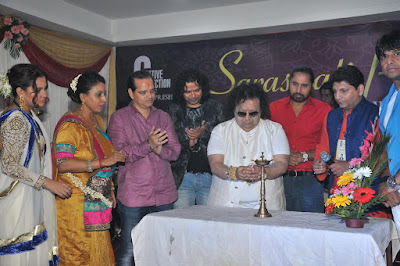 Legends Bappi Lahri launched Creative Connection’s. The launch commenced with lighting the lamp. The rituals were followed by Saroswati Devi Pujo & Bhog. Adding to the merriment, the evening continued with entertainment programmes. The launch witnessed the presence of Bhappi Lahiri, Hrishitta Bhatt, Champak Jain. Kunika Lal, Nasser Khan, Raja Hassan, Liza Malik, Tochi Raina etc. For all those nobles souls who would like to extend their helping hand to all the underprivileged people, the membership token fees is Rs. 1000 now. “Help people become motivated by guiding them to the source of their own power” a group of creative people from different fields of art and music came together as active members of the group to set up a maiden venture- Creative Connection’s. Creative Connection’s to work with grassroots initiatives for effecting positive changes in the lives of underprivileged children, their families and communities. Creative Connection’s underscores the fact that helping is not simply a matter of dispersing money but of making a deep, long-term commitment and casting a hard eye on results. Charity is just not writing cheques & not being engaged but Philanthropy is being engaged, not only with your resources but getting people & yourself really involved & doing things that haven't been done before. For an emerging country like India, development of underprivileged children holds the key to the progress of the nation itself, and their education is the cornerstone of this progress. But education for children cannot be achieved without ensuring the welfare of the family – a child can go to school regularly only when the family, particularly the mother is healthy and empowered; the family has decent livelihood opportunities and a steady income. Realizing this, Creative Connection’s, beginning in the corridors of education, will soon adopt a life cycle approach with intensive programmes focused on family health, livelihood and women empowerment, which address the needs of children, their families and the larger community.